Halloween Weekend hop on board The Shindig At Sea and sail to Mexico with live performances from Devin Dawson, Chase Bryant, Drew Baldridge, Brooke, Eden, LA's own Redwood Black and Curt Chambers! Go Country 105 has your chance to win a country music cruise vacation. 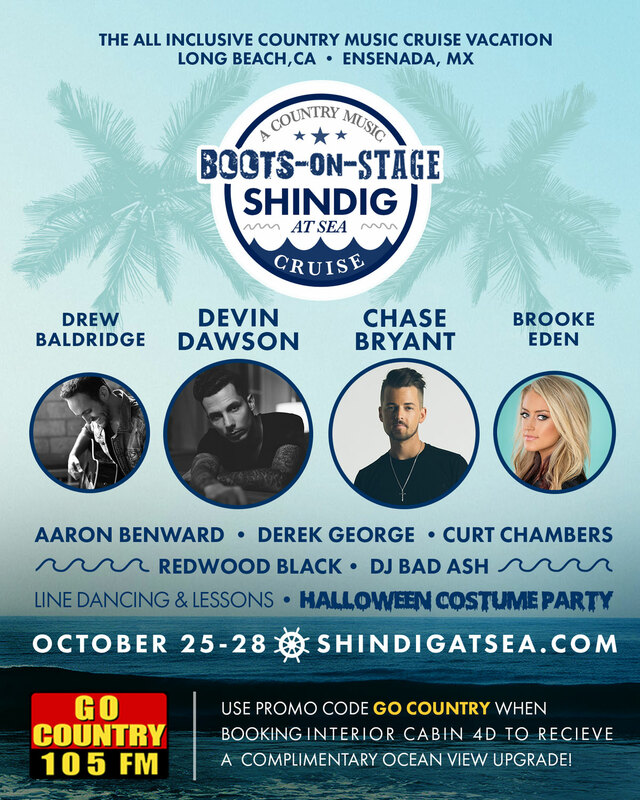 Boots On Stage brings you “The Shindig At Sea.” Sail to Mexico with live performances from Devin Dawson, Chase Bryant, Drew Baldridge, Brooke Eden, and LA’s own Redwood Black and Curt Chambers with line dancing and a halloween costume party! Happening October 25th through 28th. Listen all week for your chance to win! Book your cabins now at ShindigAtSea.com as we sail from Long Beach on Oct. 25th with Boots On Stage for a country music cruise vacation! How to enter: Listen to Go Country 105 from Monday September 10, 2018 beginning at 6:00am PST through Sunday September 16, 2018 at 8:00pm PST. Listeners will be invited to call in by the announcer or a recorded prompt at designated times over the course of the week long promotion. One (1) winner will be selected on each occasion to win one (1) digital download or CD of the new Devin Dawson album and will be entered into the drawing for a grand prize trip for two (2) people to the Boots on Stage Country Cruise leaving Los Angeles to Mexico and back from Thursday October 25, 2018 through Sunday October 28, 2018. One (1) grand prize winner will be randomly selected at the conclusion of the contest from all qualifying winners to win the trip. Description of prize: Thirty-eight (38) qualifying prizes of the latest Devin Dawson digital album or CD. Value: $15. One (1) grand prize winner to be awarded a trip for two (2) people to the Boots on Stage Country Cruise leaving Los Angeles to Mexico and back from Thursday October 25, 2018 through Sunday October 28, 2018. Winner to receive an inside cabin for a total of two (2) guests unless noted otherwise by Go Country 105. Value: $1,750. Go Country 105 and Boots on Stage are not responsible for any other expenses, including ground transportation, meals, taxes, fees, etc. Go Country 105 reserves the right to change the dates of this contest and or dates of the trip, or provide a substitute grand prize equal in value. Prize is non-transferable and must be used on the exact dates specified above unless changed by Go Country 105. Trip is for two (2) people: one (1) winner and one (1) guest. NO EXCEPTIONS. Once distributed, misplaced, lost or stolen tickets to any scheduled event cannot be replaced. During the course of the trip, if any event is canceled or postponed be by act of God or the result of war, riot, sovereign conduct, or the act or conduct of any person or entity not party to the trip, then Go Country 105 shall be excused from any and all obligations pertaining to the canceled or postponed trip event. This trip is rated G for General Audiences. Disorderly behavior and/or illegal conduct may result in revocation of trip winner and their guests' accommodations, and participation in scheduled trip events. Each Trip Participant must individually execute a release & waiver forms, releasing Go Country 105, and its owners, employees, trip personnel, representatives, agents, directors, officers, successors and/or assigns from any and all claims or liability including but not limited to such liability arising from any acts or omissions resulting in injury to body or property of contest winners while on the trip. Each trip participant must also sign a 1099 form and return to Go Country 105. Grand prize may not be sold, redeemed for cash, traded, transferred, or rescheduled to dates other than as set forth above. Selection of grand prize winner: By Monday September 17, 2018, Go Country 105 will randomly select the grand prize winner from all qualified entries. Grand prize winner will be contacted directly by the Go Country 105 promotions department. Additional qualifications: Listener cannot have won a previous Mt. Wilson FM Broadcasters, Inc. contest in the previous sixty (60) calendar days from the day of entry. Winner and winner's guest must be 21 years or older. Winner must confirm acceptance either by phone or e-mail of the prize and provide full names, date of birth, and address to Go Country 105 within five (5) business days of being contacted by Go Country 105. In the event that information is not provided or in the event that the prize is not confirmed within the allotted time, the winner's prize will be voided and no substitute prize will be awarded. Go Country 105 reserves the right to cancel this promotion at any time. Go Country 105 also reserves the right to substitute a prize of equal value including a cash prize. Winner and guest must have a valid passport at the time of the trip in order to board the Boots on Stage Cruise. All other Go Country 105 contest rules apply.